This is an ammonite, discovered in a local garden. 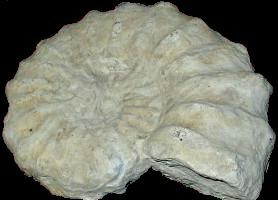 Ammonites are often found in the chalk which underlies the area. This is because the South Downs were once a warm sea. Sea creatures like this shellfish fell to the sea bed when they died and gradually compacted into chalk. This happened up to one hundred million years ago during the Cretaceous Age. Later the sea bed was lifted up by earthquakes and the shifting continents, which is why fossilised sea creatures can be found on top of hills around Steyning.